Hooked on Needles: Goodies - the no-calorie kind - from Green Fairy Quilts! Goodies - the no-calorie kind - from Green Fairy Quilts! I love the "Following" feature available on Blogger and probably other blog services these days, although I have not quite figured out how to show who is following Hooked On Needles on my sidebar, but that's ok. As long as I can continue to follow the many dozens of sites I enjoy looking at, I guess it really doesn't matter. If you want to see what sites I find interesting, you can check out my profile by clicking HERE. You will see all the information about me that you would ever want to know! But to the point, one of the sites I follow is Green Fairy Quilts. Have you heard of them? If not, you should go check them out. Judi has a bright and fun site, lots of great original patterns, fabulous fabric and pre-cuts, and darn it if she doesn't run an irresistible special every now and then as well! ...I couldn't! It was impossible! I ordered my very first ever Jelly Roll, Sent With Love by Deb Strain for Moda, along with that darling jelly roll quilt pattern called Strippin' Time, and two turnovers that were on sale too! See my free charm pack? It's called L'Amour by Sandy Gervais for Moda. Yummy! 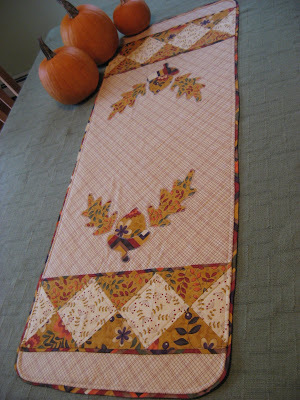 Sandy is also the designer of the charms I used in my Spring Table Runner Pattern. Love her fabrics! Aaaaah! Just look at that gorgeous roll of fabric! Oh, the possibilities! But will I ever bring myself to actually untie that Moda ribbon? Only time will tell! Right now over at Green Fairy Quilts, Judi has another great offer going on. A free Kansas Winter Turnover with any $10 purchase. That's one of the turnovers in my first picture up above! And guess what is also on sale right now...a honey bun to match each of my new turnovers! So what do you think? Did I resist the temptation and pass up on this great offer? Or did I break down once again and add to my delicious collection of Moda pre-cuts? Oh that jelly roll looks wonderful, I am not sure I could open it either!! I bet you got more so that it would go with your other fabric!! I can't wait to give strip quilting a try! 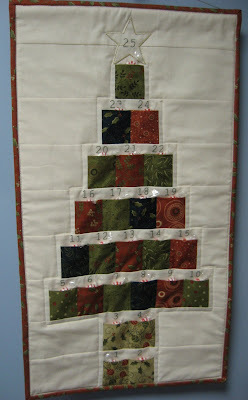 Soon I hope you can see one of my quilts on my website: mamajillof2crafts.blogspot.com. The Other Tote Bag I wanted to show off!